There is an extensive list of the combustible material, which requires to be conveyed carefully to prevent any hazard caused by the fire and that can be possible by utilizing the fire resistant conveyor belt. We are in the business of conveyor belt for more than 20 years and hence we know the best technology to bring forth a fire retardant conveyor belt that not only prevent the fire, but equally ensure abrasion resistance that makes us the prominent entity among the industries as a fire resistant conveyor belt manufacturer. We provide this rare combination of the highest fire and abrasion resistance which no one can deliver at the cost we are and hence our product has gained widespread popularity in India as well as other countries. What impels us to use the PVC/PU material is anti static property, so it does not create any static electricity, which is one of the reasons determined for the fire during the conveying the product. The offered fire retardant conveyor belt has proven its effectiveness by successfully carrying the flammable material at the highest efficiency, thanks to the skilled team of engineers who have magnified the fire resistance capacity of the respective material through implementing vulcanization and performed stringent quality test to ensure its compliance with fire test standards. Other excellent fire resistance, the proposed range of the fire resistant conveyor belt features self-extinguishing compounds that assist to stop the fire from spreading if occurs and hence ensures a higher safety even if there is a fire. Deriving selection on the PVC/PU material with the mere impression gives that extra grip to the belt, required to prevent any fall down if there is an inclined conveying, finding its application area in paper & pulp, recycling, chemical, wood, sugar, food, wood, fertilizer and other paralleled materials. This fire retardant conveyor belt is manufactured to serve the highest possible industries and therefore have made it available in the exhaustive range, whereas we are also ready to compose a range as per your specified parameters, which both are available at the cost effective rates and promise to excel even under fire. 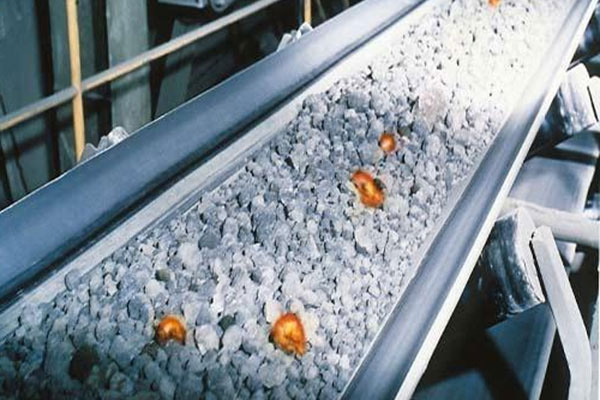 Get the relief from the agony of fire by investing in our outstanding quality fire resistant conveyor belt and yield more output efficiently.